This tea blend is vibrant with taste and aroma. The mint enlivens and soothes and with the Sicilian green tea mixed in, there is some stimulation as well. It will aid in digestion and goes well with spicy foods. 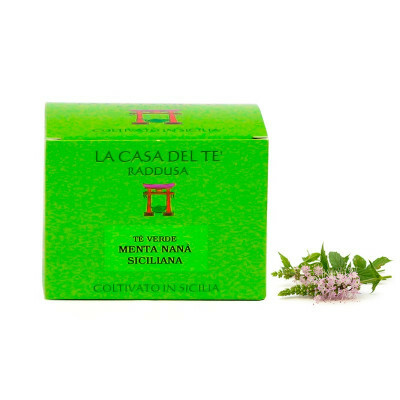 This Sicilian green tea with Sicilian wild mint has a relaxing effect and helps the physiological functions of drainage and digestion. Naturally rich in antioxidant supplements. Instruction for use: 1 teaspoon - 1 Litre of hot water - leave 5 minutes in infusion - filter and combine honey or sugar choice. Drink hot or refrigerate to enjoy a deliciously refreshing drink. For therapeutic purpose is to double the dosage (in the summer it is recommended 3 hours of maceration outside the fridge and 3 hours in the fridge make it even sweeter and more refreshing. 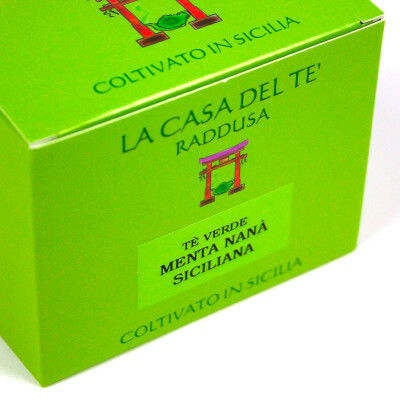 Sicilian green tea (ippia polistachia), green tea from Camellia Sinensis, wild mint leaves from Naná Mint.